The image at the top of this page is an ad from a pro-wrestling program from Charlotte NC in 1968. Call 704-377-4509 to place order for pickup. I have been collecting old wrestling programs from Charlotte for many years, including programs from Crockett shows going back to the late 1950s. Charlotte being the home-base for Jim Crockett Promotions, they went all out here in providing wrestling fans with a printed program for each and every weekly show at the Charlotte Park Center (now the Grady Cole Center) and the Charlotte Coliseum (Independence Arena/Cricket Arena, now Bojangles Coliseum.) This lasted well into the early 1970s until around the time of Jim Crockett, Sr.'s death. 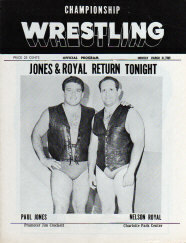 After that time, the office began producing a magazine (originally monthly, later quarterly) under the watchful eye of Les Thatcher and sold in all of Crockett's towns. The weekly programs were full of photos (usually shot by veteran area wrestling photographer Gene Gordon) from the previous week's shows, as well as posed photos with many of the top stars that had been or would soon be appearing in Charlotte. There was also a list of matches for the current week's event, promos for the upcoming weekly TV matches on WBTV-3, sometimes a mystery wrestler contest, and occasionally a puzzle. There would also usually be a letter from promoter Jim Crockett Sr., and sometimes guest columns by wrestlers or managers. Arguably the most memorable of these was the controversial "Likes and Dislikes by J.C. Dykes", the author being the manager of the hated Infernos. Another common item in the programs were advertisements from local Charlotte businesses. The National Hat Shop was a regular, where fans could buy advance tickets to the weekly shows. But the majority of the ads were food establishments, and throughout the 1960s and early 1970s, these rarely changed. Such places as Kofina's Snack Bar on West Trade Street, Little Italy Restaurant on Central Avenue, and the self proclaimed "world famous" Open Kitchen on Morehead Street. But flipping through those old programs, the ad that always caught my eye was for the South 21 Drive-In (ads seen at the top of this page.) I think it was the graphic rendering of their famous trademark bulb-lined neon sign in the ad (the same art that was featured on their food boxes) that announced "Curb Service" and the declaration of "Delicious Food". 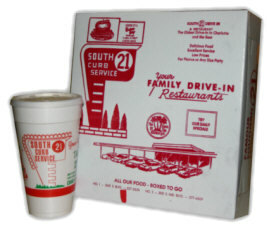 I came to learn that South 21 Drive-In was a Charlotte cultural and culinary institution. But for thousands of fans from the 1960s through the 1980s, it was a Charlotte wrestling institution as well. Ironically, fans attending matches on either Sunday night at the Coliseum or on Monday night at the Park Center couldn't grab a South 21 burger on the way to or from the wrestling show because they were closed on those two days. But the loyal support of the establishment in the form of sponsorship helped earn them the loyal support of Charlotte wrestling fans, and the iconic South 21 logo is forever connected in the minds of fans from those old printed programs. 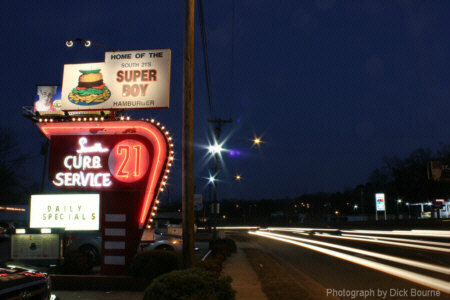 The original South 21 was opened by three Greek brothers in 1955 on South Boulevard. The "No.2" location opened in 1959 on Independence Blvd., across and down the street from the old Charlotte Coliseum. It is this second location which has become the flagship. Maria Housiadas, a daughter of one of the founding Copsis brothers, and her husband George still own and operate the restaurant to this day. Over the decades, thousands of wrestling fans enjoyed burgers, hotdogs, and fried chicken at South 21 as a result of being directed there by those ads all those years in their weekly wrestling program. 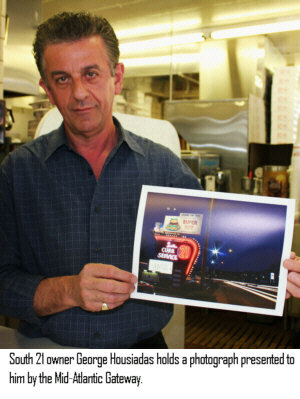 A recent book called "Hamburger America" (by George Motz, published by Running Press) listed South 21 as one of the top 100 burger joints in the entire United States. And so after having seen all those ads in those old Charlotte wrestling programs, and reading the article in "Hamburger America", I recently headed to Charlotte for a burger at South 21. At first glance, there doesn't seem to be much to this old drive-in, especially during the day, but at night it transforms into something like a small county fair, with its colorful neon sign and blinking lights and wonderful smells. The article in "Hamburger America" got me to thinking about how very little of this place had changed over the half century it had been in existence. In fact, practically nothing is different, from the trademark neon sign that blinks "Curb Service", to the big cardboard boxes used to deliver the food ("All our food boxed to go"), to the old metal speaker boxes used to call orders in to the kitchen from your car. The huge wooden painted signs behind the drive-in were particularly nostalgic, boasting of "Southern Golden Fried Chicken", Steak Strip Sandwiches, the "Fish-O-Burger" (served with a Cherry-Lemon Sundrop) and their famous "Super Boy" hamburger, touted as "a meal in itself!" One of the large boards now boasts a photograph of the drive-in from 1967, before Independence was a divided highway, with the dome of the Charlotte Coliseum seen in the distance. Backlit signs hang under a covered walkway touting Fried Speckled Trout, Delicious Homemade Onion Rings, and the Super Boy. One of my personal favorites on the menu, besides the burgers of course, is the jumbo fried shrimp plate served with a mountain of hot fries. Those beautiful shrimp are fried to tender crispy golden perfection! South 21 is a throwback to the days before golden arches dominated the landscape. It is the real deal, a step back in time. And over the years I've learned that small locally owned independents like these don't stay open for over 50 years if they aren't doing something right. In the case of South 21, they do two things right: good food and fast friendly service. Add to that the fact that this place is decidedly old school, and it is a winning combination. It's always such a nostalgic rush driving east on Independence Blvd. and spotting the majestic domed roof of the old Charlotte Coliseum rising up above the trees. So many great wrestling events were held in that building, so many great names performed there. There were great tag teams like Johnny Weaver and George Becker, Rip Hawk and Swede Hanson, Ric Flair and Greg Valentine, and my favorites the Minnesota Wrecking Crew - Gene and Ole Anderson. Great champions like Wahoo McDaniel, Jack Brisco, Harley Race, and the Four Horsemen, they all did battle in the hallowed halls of the Coliseum. It was the house that Jim Crockett built. Old man Crockett and his crew did more business in that building than any other series of attractions, events, or performances. A big tip of the hat goes to South 21 and the Copsis brothers for their long time sponsorship of Mid-Atlantic Championship Wrestling through their weekly advertisements in the Charlotte wrestling programs in the 1960s and 1970s. That, along with their proximity to the old Charlotte Coliseum, make them a Mid-Atlantic Wrestling tradition all unto themselves. I waste a lot of time wishing I could go back in time and see Jerry Brisco wrestle Rip Hawk for the Eastern title or Blackjack Mulligan battle Masked Superstar in a Texas Death Match, or the Anderson Brothers go another one hour broadway with Paul Jones and Wahoo McDaniel for the tag team championship, all just once more in the jam packed Charlotte Coliseum. And maybe after the matches, we'll stop by South 21 Drive-In for a burger. Sadly, we'll never see Mid-Atlantic Championship Wrestling again, but we can go have that burger in almost the exact same circumstances we did all these years ago. This is a grand tradition that has stood the test of time and resisted the tides of change. That's an opportunity I ought to take advantage of more often. Copyright © 2008-2011 Mid-Atlantic Gateway • Story originally published 5/4/2008, Updated 4/9/2011.